Technology clearly isn’t the only business booming in California’s Silicon Valley. As that industry continues to flourish, there is significant demand for business-centered hotels not just in the San Jose area, but all throughout the San Francisco peninsula. Hence the need for a Hyatt House and Hyatt Place project, a 21-month build that broke ground in the late summer of 2016 and is expected to finish in May 2018. Given the activity surrounding the project, it’s easy to see the need for its development. A massive office project will add about 2 million square feet of office space right across the street. Additionally, Samsung Semiconductor is building a 680,000-square-foot headquarters just down the road from the Hyatt site. Given the continued expansion in technology, a number of hotel chains including Kalthia Group Hotels and Sheraton are all planning facilities in the South Bay area. The Hyatt House/Hyatt Place combination, though, is a unique approach – while both hotels will cater to business travelers, the Hyatt Place portion will be seven stories, made predominantly of concrete and glass. The building will feature 190 rooms, all larger than typical hotel rooms, with separate living and sleeping areas. The Hyatt House portion will contain five levels and 165 hotel rooms. The design is slightly different, with four stories of wood built on one story of concrete. The Hyatt House structure will feature residential-style guest rooms with spacious living areas and full kitchens. That experience has proved invaluable on this project because San Jose has become such a hot market to build in. First and foremost is the fact that quality subcontractors within the area proved difficult to hire, given all of the building going on in the South Bay. “That means the EIFS workers had to be hired out of Fresno, while the carpet workers were hired out of Los Angeles,” Metcalf recalls. 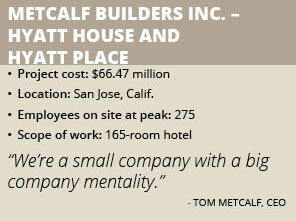 Because those subcontractors bring valuable experience and knowledge to hotel projects, Metcalf has been very pleased with the results. “We have been very fortunate to not only have subcontractors that follow the flag, but we have found some excellent local subcontractors as well,” he notes. In addition to having to bring in subcontractors from across the country, this project has already posted some unique challenges for Metcalf. In January, 2017, northern California experienced record amounts of rainfall. 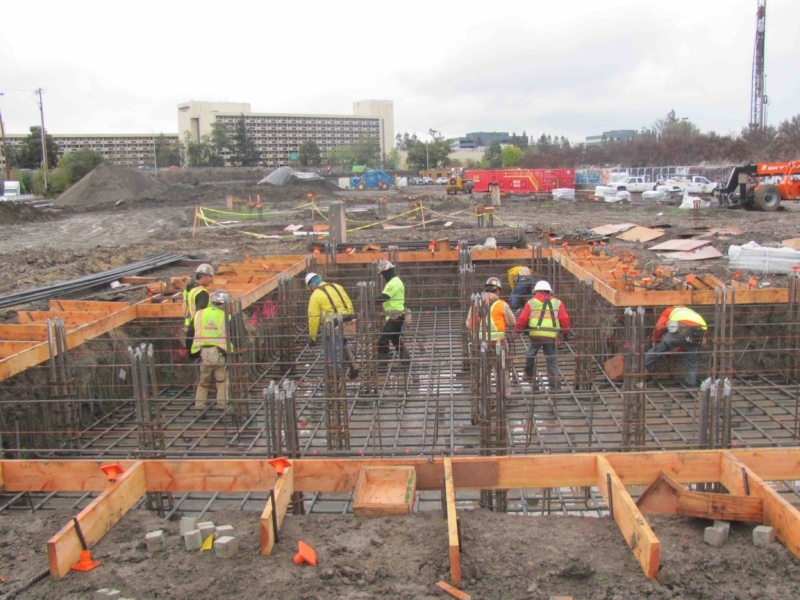 That created ground conditions that included a very muddy clay substance, making it difficult to drive concrete piles, dig and pour foundations. “We were literally stuck in the mud for about two-and-a-half weeks,” Metcalf recalls. The Hyatt House and Hyatt Place project represents a huge feather in Metcalf Builders’ cap, and it also represents another step away from the disastrous construction downturn in Nevada in 2008. “At that time, practically everything from retail to housing to infrastructure completely dried up,” Metcalf states. While the company had roughly 45 employees at its peak, those stringent economic conditions forced Metcalf to practically reinvent the company. “I call it ‘Metcalf Builders, 2.0,’” Metcalf states. For Metcalf, having to reinvent the company under less than ideal conditions was nothing more than the latest chapter in his long, storied family history. It all started with his great-grandfather, who founded a drayage service in the early 1900’s, moving houses with hand crank jacks and horse teams from house site to house site. . That led to housing construction jobs, and a family legacy was born, continued by Metcalf’s grandfather and father, Norman “Red” Metcalf. Tom’s daughter, Lauren works as an Assistant PM in the main office and is our 5th generation builder. Our most recent edition is Lauren’s son, born in August of 2016. Elijah even has his own office now. Red Metcalf started building houses early in life and was eventually hired by the legendary Charlie Pankow. He continued to work as a superintendent on projects in Hawaii and California, but eventually moved to Reno where he started MBI with his son Tom in 1994. Today, Red serves as the company’s chairman while Tom is the CEO. As Metcalf recalls, “We were an island in the high desert,” meaning there weren’t that many subcontractor firms in the area when the firm was founded. Just as we built in Hawaii for 25 years. We needed to bring that same team spirit to Northern Nevada. In 1997 the company started building 7-11s for Southland Company, turning that experience into numerous other retail, Medical, Office, Hospitality and multi family housing projects throughout the country and growing steadily until the 2008 downturn. Given its history and capabilities, MBI 2.0 finds itself in prime position to grow in the coming years, even if it doesn’t leave Nevada for work. “There is so much demand for multi family housing in northern Nevada,” Metcalf says. “Some estimates say we’re going to need upwards of 5,500 apartments in the next five years.” For now, it looks like Metcalf builders, and northern Nevada, are back to full speed.